You might think that a bunch of people living in the Haiku jungle would be more lackadaisical but the reality is that they can mobilize better than any municipal government. 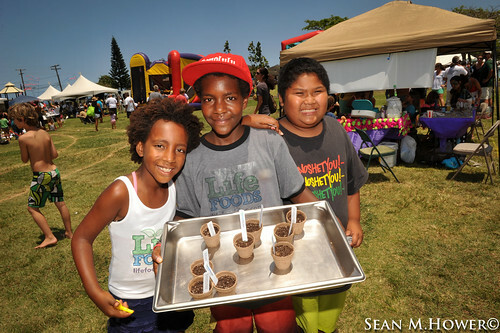 A good example is the Haiku Ho’olaulea & Flower Festival, which benefits the Haiku School and turns 21 this Saturday at the Haiku Community Center. In 1993, Haiku visionaries and Haiku Community Association board members Mike Gagne and the late Ed Silverstein started the event. That year, they raised $700 for the Haiku PTA. Gagne and Silverstein looked at the event as a way to share Haiku’s history, culture and community, so they lined up some crafters, food and entertainment and everyone had a good time. In 2013, the event raised just over $50,000. The generosity of the community when it comes to this event is really unprecedented. In fact, several vendors donate all of their proceeds. Mike Gagne, one of the event founders is still active with the event, and says the HCA wants to fund all the enrichment programs it can for the school and assist the Haiku Boys and Girls Club. The HCA has been busy. This year, they did a big push to get the Kalakapua Playground in Haiku open, and they have a host of other achievements planned. Gagne says the biggest challenge with the event is getting a volunteer workforce to cover the festival’s 450 shifts. Ho’olaulea will have parking across the street from the Haiku Community Center for $3, and starts this Saturday at 9am. Like last year, this is a green event, and attendees are asked to bring their own water bottles (they will offer refills for a few bucks). Bring reusable bags for purchases, and reusable forks and plates for eating.